It doesna��t matter whether youa��re used to cruising cross country on your Superlow or tearing up the road on your Street 750. If you own a Harley-Davidson, youa��re invited to contribute to the roar of bikes that will make their way to the third edition of the Southern HOG (Harley Owner Group) rally in Hyderabad. 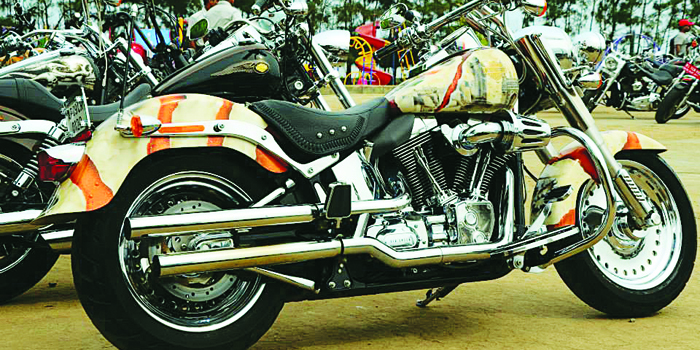 After the 350-odd bikes that were spotted at the second edition in Mahabalipuram last year, Ricken Desai, one of the organisers from the Banjara Hyderabad HOG chapter, says theya��re prepared for at least 500 mean machines this year. The event (September 26-28), taking place at Novotel Hyderabad, will feature mechanical bull rides, tattoo parlours, tug of war challenges, and more. a�?But ita��s the ride to the venue that will be the focus,a�? Desai insists, pointing out that riders are expected to pour in from New Delhi, Pune, Chandigarh and Ahmedabad, in addition to the Southern chapters. a�?We formerly used to communicate through hand signals while riding, but now we all connect via Bluetooth headsets,a�? shares Vergis KR, CEO of city-based Uniware Systems, who has done over 15 rides on his Harley (most of them with his wife). Vergis is one of the bikers making the trip from Chennai. a�?This year, there will be a special yoga session that will teach riders about asanas that help on long rides,a�? Desai shares, adding that other highlights will be an open barbecue set up by Webber, and Irish whiskey by Jameson.